Cowes Enterprise College, part of Ormiston Academies Trust, said the new curriculum would help pupils get jobs in a growing sector that suffers skills shortages. The new maritime-based curriculum will be developed with funding support from Ormiston Trust and a £97,000 grant from the Edge Foundation educational charity. 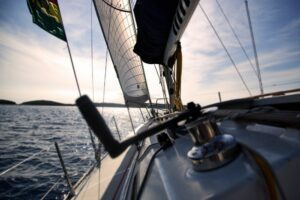 Among the less conventional curriculum subjects to be offered are: boat building, navigation electronics, celestial navigation, admiralty chart conventions, shipping forecasts and practical boat-handling skills. Pupils will also attend the annual Cowes Week regatta. Ormiston Academies Trust said it hoped to extend the curriculum to its other academies in coastal areas at Grimsby, Great Yarmouth, Lowestoft, Chichester and Burnham-on-Crouch. Maritime studies would form part relevant curriculum subjects, with practical learning linked to the maritime industry. The skills involved would enable pupils to access education and employment while remaining on the island, the college said.